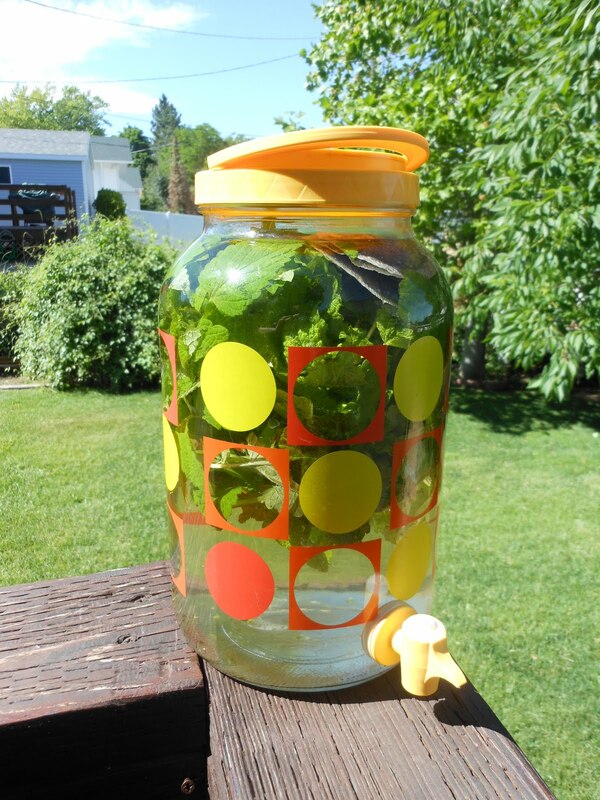 Sun Tea- Cosmo Hippie Chef Alert! When I was a kid my parents would make sun tea in the back yard during the summer. I’m not sure why I loved seeing that ice tea decanter sitting in the sun, but I just thought is was neat. So now that I have my own backyard it’s time to make sun tea! It is easy, the sun does all the work and it is cool and refreshing on a hot day. Plus you can make whatever flavor of tea you like. Enjoy! 1. Start by putting the mint in the bottom of the decanter and muddle just a bit w/ a wooden spoon. 2. Next add in the tea bags and water, place the lid tightly on the decanter. 3. Then place the water, tea and mint filled jar somewhere in your yard where it will get the most sun all day, leave it out all day. 4. At the end of the day bring it in and let cool just a bit and then place the jar in the fridge to chill.